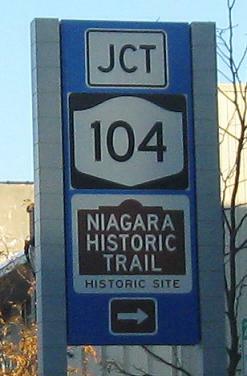 3rd St. NB in Niagara Falls. 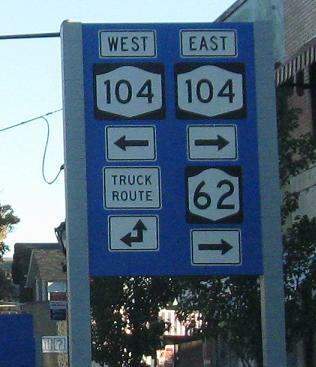 US 62 and NY 62A (now US 62 Business) both begin at NY 104, but there is no NY 62. 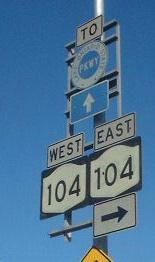 NY 104 is elevated partially above Robert Moses State Pkwy. through Devils Hole. This WB shield is typical of the new style, the only parkway with an elongated shield, but at least it keeps "State" inside. Ancient shield now recycled as a NO TRESPASSING sign near Orleans, courtesy Doug Kerr. 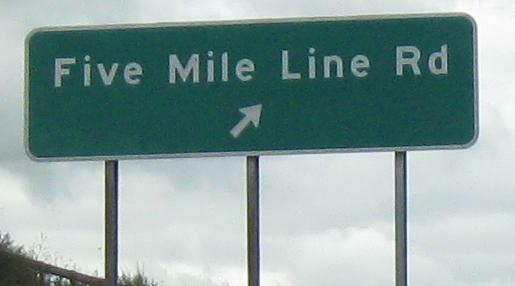 This is nowhere near the original route, and so faded that the old writing shows up better than the paste job. 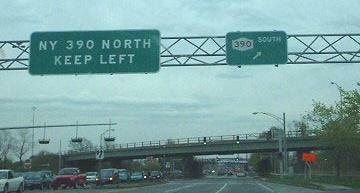 Two EB photos in Rochester, courtesy Doug Kerr and gone now. 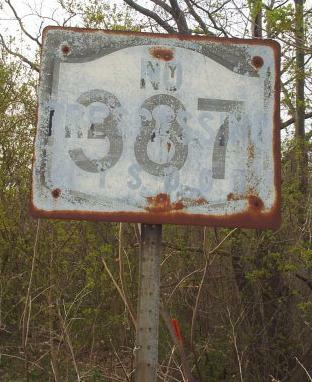 Further south, NY 390 will become I-390. Somewhere in Rochester, courtesy Doug Kerr. 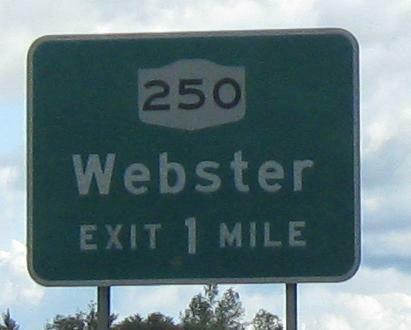 EB on the freeway leaving Rochester. WB photos from the frontage road (the second sign is on the freeway). A single windmill stands among the power lines on either side of the railroad in Union Hill. EB east of Wolcott. 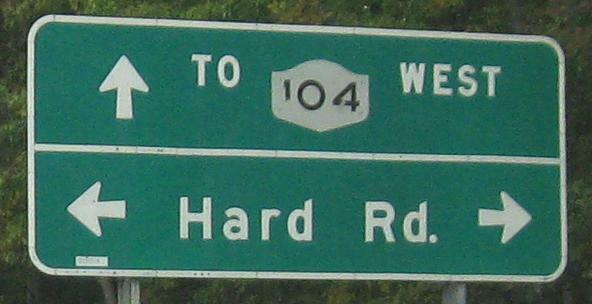 Old NY 104 from here west is Ridge Rd., which runs into NY 370 and then heads up NY 104A to Red Creek before coming back into 104. 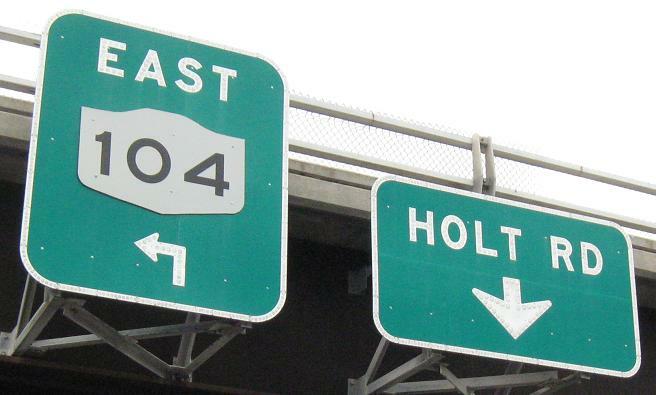 The original plan was to extend 4-laning of NY 104 all the way east from Williamson, which you see at the NY 89 underpass (the only evidence of this plan, too). 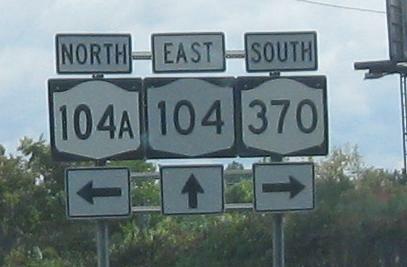 One old shield and one old arrow remain, but not matched up, at NY 38, where you can compare the correct NY shield (the one on 104, to the left) to the new wrong style (on 38, to the right). 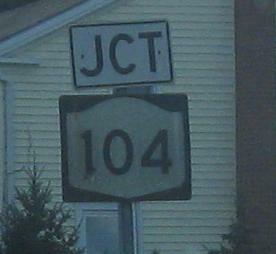 Yes, Virginia, there really was a US 104. 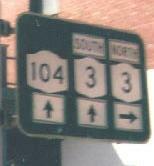 This is NY 104 now, after having been decommissioned in 1971, but old shields remain. As do wrong shields, like this one courtesy Doug Kerr. 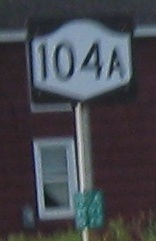 There really still is a NY 104A. This is the first WB shield, in the uglier new style with more black space. Oswego is trying to be classy, but this strikes me as a case where engineers didn't have the final say. Notice any problems with these signs? 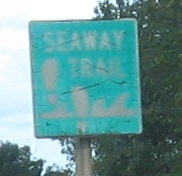 The Seaway Trail follows the U.S. coast of the Great Lakes on the nearest through road, here NY 104 WB. 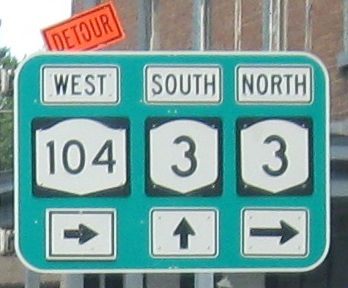 WB at what's normally a brief multiplex in Mexico (not the country), but there's a detour for NY 104 (via NY 104B) that resulted in a temporary arrow. 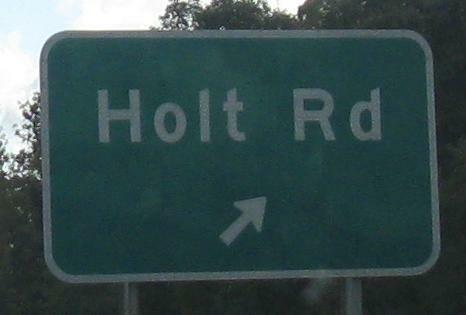 To see the sign as it was made (minus a "West" as well, whether it had fallen off or never previously existed), click for an older photo courtesy Doug Kerr. 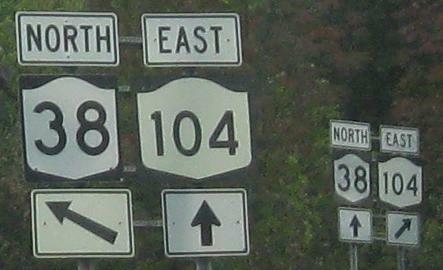 The two routes also cross southwest of Oswego.